The Middle Stump: Time to point the finger elsewhere? With defeat at Lord's against India, England have succumbed to their worst winless streak for twenty years. In 1994 I experienced my first ever test match, the first day of the Ashes in Brisbane. How as a nine year old I wasn't scarred for life, spending the day sober watching Michael Slater slap a poor bowling attack of Defreitas, McCague, Gough & Tufnell around the Woolloongabba I'll never know, but somehow I am a lover of cricket and a perennial sufferer of English cricket. But the question that I ask, is English cricket as low as it was then? Overall I'd say no, but I'm worried about the direction it is going. 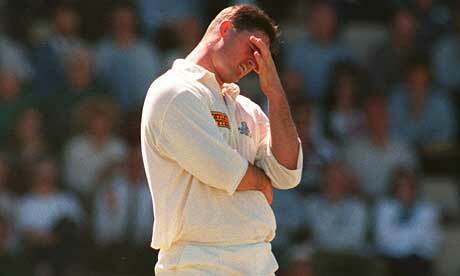 In 1999 English cricket arguably hit rock bottom against New Zealand. In the aftermath three strong, if slightly confrontational men turned the fortunes of English cricket around. Duncan Fletcher and Nasser Hussain are widely applauded for their work but for me the mystery third man of David Graveney, goes without the praise he deserves. Under his eleven years of stewardship as the Chair of Selectors, some great England players have come through the ranks. Marcus Trescothick, Michael Vaughan and James Anderson to name just three who reached international prominence without a sparkling record at domestic level. Anderson was plucked from Burnley obscurity, whilst Vaughan and Trescothick had mediocre averages. I accept that several of the players were Fletcher's picks but ultimately Graveney would have had to have seen a glimpse of what Fletcher had seen in their temperaments. 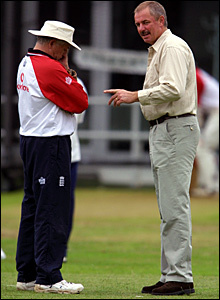 In 2008 David Graveney was moved aside to accommodate Geoff Miller as Chairman of Selectors, and recently James Whitaker has replaced Miller. This is where I believe a lot of England's problems stem from; poor selections from weak selectors. This winter England were ridiculed for a shambolic squad for the Ashes. Three tall bowlers, two without form and one without international experience, no back up wicket keeper and a reserve spinner who got into trouble with a bouncer long before Mitchell Johnson starting bowling them! The Australian community laughed their way to an Ashes whitewash. This current panel of selectors winds me up no end, Whitaker, Fraser and Newell. I just don't see any of those men making majestic selections. Whitaker played one test long before Root, Stokes and Ballance were even born. Fraser has been retired from the game for twelve years and Newell even longer. In this time cricket has evolved immensely, mostly due to T20 and I just don't feel any of these have a strong enough grip on modern international cricket. Fraser and Newell are also tied massively to their connections with their respective counties. It mystifies me that you can have two men on a panel of three who are full time employees of counties. On a Tuesday how can they be expected to run off to Headingly to watch Bresnan for instance, before hopping across the Pennines to Old Trafford on Wednesday to watch Jos Butler, when Notts and Middlesex are playing at Lords? Now for my view on how England is going to get out of this rut. You've given Moores the chance to have a go again, and I think it's only fair to give him that go for a while longer. However Whitaker has been a selector for some time now. He may be only new to the chairman role but I have no faith in him. As for Newell and Fraser it's just too much a conflict of interest to be employed by county and country. If you look at the likes of Trescothick who came through the short form to test cricket, look across the globe and David Warner has followed a similar path. I just don't feel this group of selectors have the guts to do that with the likes of Buttler or Hales. Nasser Hussain : Ballsy, fiery and will pick players with fight and hard work. Mark Butcher : always insightful in the Sky box so in a prime position to watch a large pool of players. Matthew Hoggard: Always need a Yorkshireman in charge. Back up (once retired) Marcus Trescothick: arguably best English batsman of last twenty years. For me all of these candidates would work together to provide a fantastic panel who are detached enough from the current crop of players without having been away from the game for too long. Hales, Robson, Ballance, Morgan © , Root, Ali, Buttler, Borthwick, Plunkett (share the new ball with Anderson), Broad, Anderson. The three big decisions are to drop Cook, Bell and Prior. Cook and Prior are self explanatory but Bell is out of form and someone in that middle order needs to make way for Morgan to lead the side. However I just don’t see these strong decisions happening any time soon.